Why do so many people now believe in conspiracy theories, and what is the evidence to support them? What is the meaning of the many prophecies which say that we are now in a 'New Era' of massive change? Why is there such huge but officially undeclared interest in paranormal phenomena from authorities and religions? How does all of this tie together and explain the agendas of control and surveillance in the West? The Truth Agenda explores some of the most famous unexplained mysteries and global cover-ups of recent history, including UFOs, pyramids, psychic phenomena, visions of the future and ancient prophecies, and investigates their connection to famous conspiracy theories concerning the Moon landings, 9/11, the New World Order and claims that the world is covertly run by a powerful ruling elite. Leading mysteries researcher Andy Thomas pulls these many threads together in a refreshingly accessible and stimulating overview, addressing the issues in a credible analysis which suggests that the world we live in may be very different to the manipulated picture presented by governments and the mainstream media. Many people believe that a secret global cabal is anticipating some kind of imminent huge change, based on ancient prophecies, and that it has been implementing a regime of draconian restrictions by nefarious means to ensure it retains its control throughout. Is a spiritual and philosophical revolution about to transform this situation, however, and if so what part can we all play in it..? This full-colour, high quality production, by renowned mysteries researcher Andy Thomas, includes nearly 200 photographs and has been widely acclaimed as the best guide of its kind. This latest third edition is fully updated and expanded with new material, including an extra Appendix chapter. Introduction; [Part One - Mysteries, Miracles and Global Deception] Making Sense of Our World; Mysteries Ancient and Modern; UFOs; Miracles and Prophecies; Grand Conspiracies; [Part Two - Deconstructing Consensus Reality] One Giant Leap..? ; Weapons of Mass Deception; 9/11; [Part Three - Tools of Control] The War on Liberty; Caging The Human Spirit; The Green Dilemma; The New Era; [Part Four - Solutions and Inspirations] Who Are We Dealing With? ; The Power of Collective Thought; The Power of Positive Action; [Appendices] These Are The Times; Notes; Further Resources; Picture Credits; Index; The Author. "Utterly fascinating... This book is a triple-strength espresso-charged wake up call." (Kindred Spirit). "Immensely well-researched and immaculately presented... The best book on the subject I have read." (Paradigm Shift). "A useful overview of the current situation regarding some key alternative topics." (Fortean Times). "Rather brilliantly, Thomas explains how we can transform pessimism into positive action... Utterly mind-blowing." (Spirit & Destiny). "A truly outstanding book." (Ian R Crane, Alternative View). "A profoundly disturbing but ultimately uplifting handbook for these turbulent times." (Western Daily Press). "This accessible and comprehensive book is an excellent guide... Detailed and convincing." (Soul & Spirit). "A very good sifting of information and provision of references... Thomas's command of the issues is exhaustive and well-referenced." (Caduceus). "The author joins the dots in a stimulating overview of our global situation." (Network Review). "Just the sort of book you need in order to make sense of the great mysteries and conspiracies of our times." (Nexus Magazine). "A timely and important book. Buy a copy, read it and pass it on." (New View). Andy Thomas is one of Britain's leading authors and lecturers on unexplained mysteries and global cover-ups and is author of many books, including Conspiracies: The Facts - the Theories - The Evidence, and Vital Signs, which has been widely described as the definitive guide to the crop circle controversy and was nominated for Kindred Spirit magazine's Best Book award. 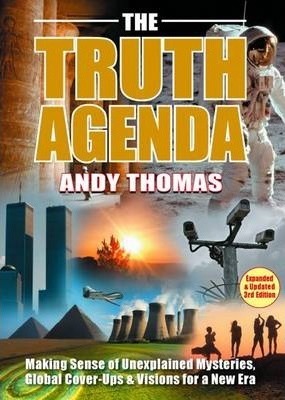 The Truth Agenda has been acclaimed as the best available overview of paranormal mysteries and conspiracies. Andy has written articles for many publications, and regularly contributes to Nexus Magazine. He is also author of several books about his historical birth town of Lewes in East Sussex, England. A very active lecturer, Andy is renowned for giving striking live presentations, and speaks extensively across Britain and in many parts of the world, including America, Australia, Brazil, Peru and various European countries. He is also co-presenter of The Glastonbury Symposium, one of the UK's longest-running and largest annual alternative conferences, as well as being co-founder of the Changing Times group, which holds regular events on alternative views and truth issues. Andy has made numerous radio and TV appearances, including UK television spots on BBC 1's The One Show, Channel 4's Richard and Judy, ITV's GMTV, BBC 2's Esther, and Sky 1's Pineapple Dance Studios, and he has featured in many programmes in countries across the globe.